Just as you have a specific vision for your store’s brand, colors, fonts and overall look and feel, the same goes into creating the email templates you see and send through SnapRetail. This month, we’re highlighting a soft and feminine Valentine’s Day template. 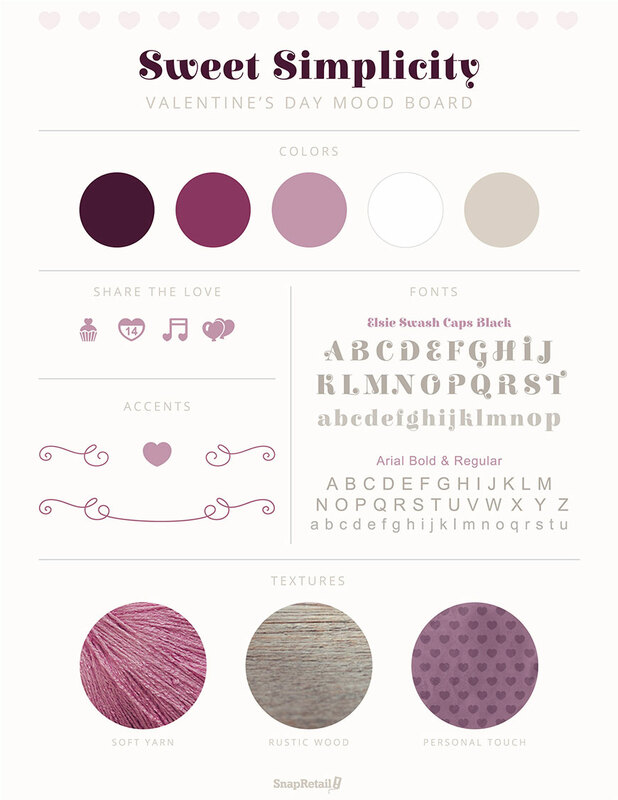 Shades of pinks and purples combine with pretty, but readable, fonts to create a unique template that will have your customers feeling the love this Valentine’s Day. Take a peek below into the vision behind the design of this feminine template from our graphic designer Jocelyn Cocain. Valentine’s Day gives everyone the opportunity to express the feminine side within. For this template, I chose to use design elements to capture the essence of bold feminine energy. This holiday is typically symbolized by red and pink. For this template, I decided to focus on shades of magenta to create a unique template for you to send to customers. I decided upon the header image because of the warm dominant textures within. The soft pink yarn and rustic wooden texture accompanied by the headline, “Share the Love,” provides the viewer a loving feel. When I came across the font Elsie Swash Caps, I knew it was perfect for the headline text. This font captures the feminine spirit of this template. I chose to complement Elsie Swash Caps Black with a simple Arial font. Using a more decorative font complemented by a simple font executes the elegant and simple design. To unify the template from top to bottom, I decided to incorporate dark magenta ornamental accents in both the header and footer. When it comes to Valentine’s Day this year, don’t be afraid to add your very own personal touch to this email. Incorporating images of Valentine-themed displays around your store or an image of your employees showing their love for the holiday are great ways to personalize it. Most of all, highlight special promotions for the holiday and feature gift ideas. Keep the product images you choose consistent with the look and feel of the template by selecting products with similar colors and textures. Click here to send this Valentine’s Day email.